Transitional Justice Theories is the first volume to approach the politically sensitive subject of post-conflict or post-authoritarian justice from a theoretical perspective. It combines contributions from distinguished scholars and practitioners as well as from emerging academics from different disciplines and provides an overview of conceptual approaches to the field. The volume seeks to refine our understanding of transitional justice by exploring often unarticulated assumptions that guide discourse and practice. To this end, it offers a wide selection of approaches from various theoretical traditions ranging from normative theory to critical theory. 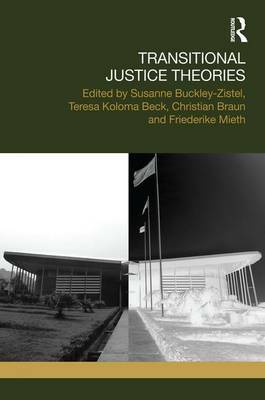 In their individual chapters, the authors explore the concept of transitional justice itself and its foundations, such as reconciliation, memory, and truth, as well as intersections, such as reparations, peace building, and norm compliance. This book will be of particular interest for scholars and students of law, peace and conflict studies, and human rights studies. Even though highly theoretical, the chapters provide an easy read for a wide audience including readers not familiar with theoretical investigations. Buy Transitional Justice Theories by Susanne Buckley-Zistel from Australia's Online Independent Bookstore, Boomerang Books.